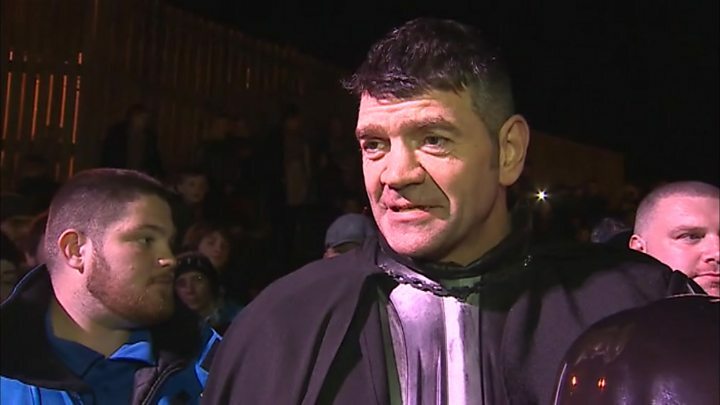 Media captionDarth Vader actor Spencer Wilding says it was "amazing" to play the "number on baddie"
Darth Vader and Imperial Stormtroopers have invaded a Denbighshire seaside town to welcome the actor who plays the infamous villain. Spencer Wilding, who hails from Rhyl, was the guest of honour at a special screening of Rogue One. He had to muster all powers of the force to keep his Vader role secret until the film's release. "It's a hell of a secret to keep," said Wilding, who was cast as the body actor for the role. "But when you're a professional actor - when you sign that black and white sheet of paper saying you cannot say a word... I'm true to my word and I didn't say anything." Speaking to BBC Radio Wales' Good Morning Wales programme, the 44-year-old said it proved a tricky task after rumours of the role leaked a year ago. "I've been having hundreds of people every day for a year asking me if I'm Vader," he said. "If I had a pound for everyone who asked I'd be buying myself a new Death Star - and it'd be gold plated." The 6ft 7in (2m) tall actor already has a string of Hollywood appearances to his name, including Guardians of the Galaxy, Green Lantern, three Harry Potter films and the TV blockbuster Game of Thrones. He said the Vader role came from a regular casting call, first with a self-filmed tape, then a recall to Pinewood Studios. "It's very, very secretive. We didn't even know exactly what the character was and what film it was until we got there," he said. "I opened up the curtain when I went in the dressing room and there he was - Vader. "I'm always pinching myself - I am definitely awake - it is not a dream, it is just another dream come true." While the actor has the body role, just like his predecessor in the original Star Wars films David Prowse, the voice of Lord Vader is actor James Earl Jones. That did not stop Wilding trying out the voice during filming. "I'm not James Earl Jones - nowhere near him - but you know I got close to him I think, which helped the other actors - you know, you've got Vader in front of you."